Valerie Bothell: Quilting: the new classics! A couple of years ago, I received a fun email from Michele Muska. She told me that about this idea she had for a book and would I be interested in participating. Allie and I were just finishing up the book we wrote together (you can get one here) and it sounded like a fun way to keep myself busy again. Not only would I be designing with Allie again for this book, but in total there were going to be 20 different designers included. I read the list of designers and I knew instantly that this was going to be a great book and I felt very honored to be included. All quilters draw inspiration from the past. But how do today's artisans put their personal stamp on classic patterns? Twenty influential quilters from across the stylistic spectrum present their unique creative vision of timeless designs. Each pattern, Double Wedding Ring, Crazy Quilt, Dresden Plate, Bear Paw, Log Cabin, Nine Patch, Hexagon, Yo-Yo, Flying Geese, and Rail Fence, comes with step-by-step instructions for two adaptations, one traditional, the other modern. The book also includes a history of each pattern, images of heirloom or museum-quality quilts for inspiration, easy-to-use templates and essential quilting techniques. Forwards by Meg cox and Janneken Smucker. 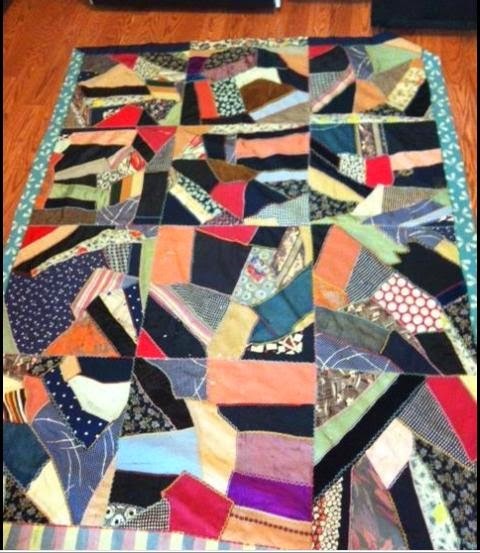 Michele sent a picture of a crazy quilt that was made by her great aunt Sadie(pictured above). We decided that it would be fun to reproduce one of the blocks each in our own style. It was made by Tamar Horton Harris North in 1877, to honor her daughter Grace who had passed away, it was my inspiration for the piece I made for Michele's book. When I received my copy of the book, I was extremely impressed! The photography is done to perfection, instructions are great and the quilts are beautiful! Definitely one to add to your library! I am participating in a blog hop with all the designers that participated in Michele's book. The following is a list of each of the designers, their blog addresses and the day they will be blogging about the quilt they made. I would invite you to take a look! Making a crazy quilt is definitely on my quilty bucket list! Although I know I wouldn't go to the detail you have! Wow! The crazy quilt is stunning and love the cover book! Love crazy quilts--they are so fascinating! I love the crazy quilt design! Your block looks great! The black and white gingham give it a very updated look! This book covers one of my favorite topics...connecting the past with the present. We have a beautiful quilt legacy in this country that cannot be replicated nor replaced...but linking the tried and true with current trends and fabrics certainly cements our place on the quilting timeline. Love the roses. Nice touch! Loving the traditional and modern together!! You made a beautiful block. It makes me want to try my hand at a crazy quilt someday.